In a which-way experiment, a beam of quantum point-like particles, emitted by a narrow source of width , is divided into two partial beams by a double slit. A beam is represented mathematically by a two-dimensional Gaussian wave packet (with negligible dispersion), constructed so that the beams can interfere. If no position-measuring device is placed in the apparatus, you can observe an interference phenomenon in region I (the gray area), which could be described mathematically as a superposition of the wavefunctions from the two arms. Suppose next that two detectors are added to the setup just behind slits 1 and 2 to register the passage of a particle. The wave always goes through both slits and the particle goes through only one. The part of the wave that is not associated with a particle is called the empty wave. The particle is guided by the wave (via the quantum potential/velocity from the wavefunction) toward places where the wave density is large and away from places where the density is small. In the absence of the detectors and , a particle passing through slit 1 (on the left) falls finally on counter , not on , and vice versa. Particles with identical energies and width never cross the axis of symmetry. If the pulsed particle source is so feeble that the particles have different energies, then, of course, the trajectory can cross the axis of symmetry, which is allowed for an asymmetric wavefunction. If the detectors are inserted, the experimental data shows for a strong measurement ( or ) that the particle traverses the left arm, registered by detector and hits the counter ; while the particle in the right arm, registered by detector hits the counter , and the trajectories do cross. In the case of strong position measuring, the interference fringes disappear. 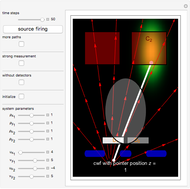 In a complete description of the measuring process, the detectors must also be described by a wavefunction. Bell  stated clearly (twelve years before the discussion about surrealistic Bohm trajectories [2, 3] began) that the naive classical picture does not hold for an isolated quantum system without measurement. The particle, arriving at a given counter, goes through the wrong slit. Reference  gives a slightly different approach, but both agree that the position measurement is the key point for understanding the which-way experiment. In the causal interpretation (CI), there is a nonlocal interaction between the detectors and the whole system, which destroys the superposition of the wavefunctions in the presence of the detectors. For an entangled wavefunction, meaning that the complete overlapping wavefunction cannot be represented as a product state in terms of independent variables, a nonlocal correlation of the particle trajectories appears. In the CI approach the condition for nonlocality is nonfactorizability. In the Copenhagen interpretation, the measurement collapses the wavefunction. 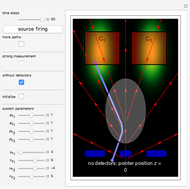 In the CI approach, the position measurement affects the total wavefunction, but in principle it is possible to do a sufficiently subtle path-determining measurement without destroying the interference pattern, which was confirmed by  in 2011. One possible way to solve the problem is to describe the interaction between the measurement device and the isolated quantum system with the conditional wavefunction (cwf) [7, 9]. Here the cwf is the system under observation, a superposition of two entangled wavefunctions, in complete agreement with the Schrödinger equation. One of the wavefunctions defines the measurement device, which here depends only on the time-independent variable (the pointer position), and the other wavefunction defines the isolated quantum system. In the CI approach, the position-measuring process decomposes the superposition state into a single state, which corresponds to the naive perception of reality, via a nonlocal interaction between the measuring devices triggered by the cwf. So every position registration of a particle, which obeys the time-dependent Schrödinger equation and which is in a superposition of states, is a nonlocal process. In the measuring process, the position of the particle in the direction influences the amplitudes of the detectors in the direction. As a result, measuring the particle's position reduces or cancels out the amplitude of the empty part of the wavefunction. The graphic shows the possible trajectory, the velocity vector field (red), and the wave density. where the are two Gaussian profiles, and where , and , are wavefunctions for the position-recording detectors. The initial starting points are chosen randomly. For the strong measurement, the initial starting points are fixed ( ). In general, the wavefunction for the detectors is time-dependent, with complex dependence on many variables. But, in the case discussed, the many-body unnormalized wavefunction for the detectors simplifies so that it depends only on the time-independent variable . Here and , where is the pointer position, which is the connection between the measurement device and the isolated quantum system. In the CI approach the initial position of the particle from which the path is calculated defines the pointer position . 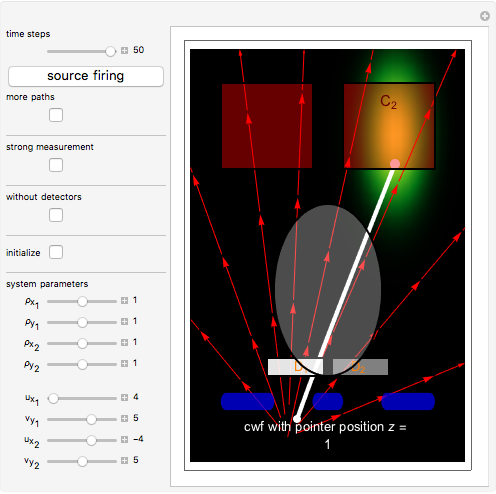 In our case the cwf is defined as the wavefunction , evaluated for special values of . For (strong measurement: detector recorded the position and counter is registering) and for (strong measurement: detector recorded the position and counter is registering), there is no interference, no empty wave, and the particle obeys the naive perception of reality. If , then the detectors are removed and the quantum system is isolated from the rest of the world. The counters always register the particles coming from the wrong slit. For , the quantum system and the measurement device are weakly connected and interference still occurs. In this case particles can take paths that contradict the naive perception of reality. For more detailed information about Bohmian mechanics, see [4–7]. The author would like to thank Detlef Dürr for helpful discussions. J. S. Bell, "De Broglie–Bohm, Delayed-Choice, Double-Slit Experiment, and Density Matrix," International Journal of Quantum Chemistry: Quantum Chemistry Symposium, 18(S14), 1980 pp. 155–159. doi:10.1002/qua.560180819. B.-G. Englert, M. O. Scully, G. Süssman, and H. Walther, "Surrealistic Bohm Trajectories," Zeitschrift für Naturforschung, 47(12), 1992 pp. 1175–1186. C. Dewdney, L. Hardy, and E. J. Squires, "How Late Measurements of Quantum Trajectories Can Fool a Detector," Physics Letters A, 184(1), 1993 pp. 6–11. doi:10.1016/0375-9601(93)90337-Y. P. Holland, The Quantum Theory of Motion, Cambridge: Cambridge University Press, 1995. S. Goldstein, "Bohmian Mechanics," The Stanford Encyclopedia of Philosophy. (Sep 30, 2015)plato.stanford.edu/entries/qm-bohm. Bohmian-Mechanics.net. (Sep 30, 2015) www.bohmian-mechanics.net/index.html. D. Dürr, S. Goldstein, and N. Zanghí, "Quantum Equilibrium and the Origin of Absolute Uncertainty," Journal of Statistical Physics, 67(5), 1992 pp. 843–907. arXiv: 0308039 [quant-ph]. S. Kocsis, B. Braverman, S. Ravets, M. J. Stevens, R. P. Mirin, L. Krister Shalm, and A. M. Steinberg, "Observing the Average Trajectories of Single Photons in a Two-Slit Interferometer," Science, 332(6034), 2011 pp. 1179–1173. doi:10.1126/science.1202218. T. Norsen and W. Struyve, "Weak Measurement and (Bohmian) Conditional Wave Functions," Annals of Physics, 350, 2014 pp. 166–178. arXiv:1305.2409v2 [quant-ph]. Klaus von Bloh "The Which-Way Experiment and the Conditional Wavefunction"